Leeds Stand Up To Racism is no longer using this page. We are experiencing the biggest rise in support for fascism, the far right, racism, Islamophobia and Antisemitism since the 1930s. 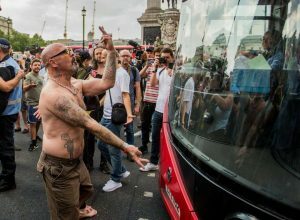 In Britain fascists and racists are mobilising on a scale not seen for decades. We must unite against this threat, which is why we are calling a national demonstration against fascism and racism on Saturday 17 November in London. 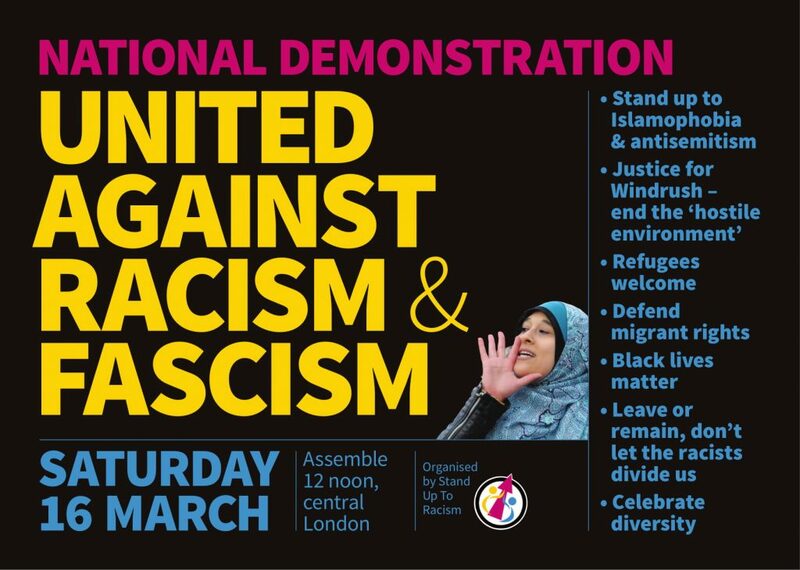 The demonstration is initiated by Stand Up To Racism, co-sponsored by Unite Against Fascism and Love Music Hate Racism, and is supported by Shadow Home Secretary Diane Abbott and Shadow Chancellor John McDonnell amongst others. There is an urgent need to build a movement against racism and fascism. Help us mobilise for 17 November by joining Stand Up to Racism. 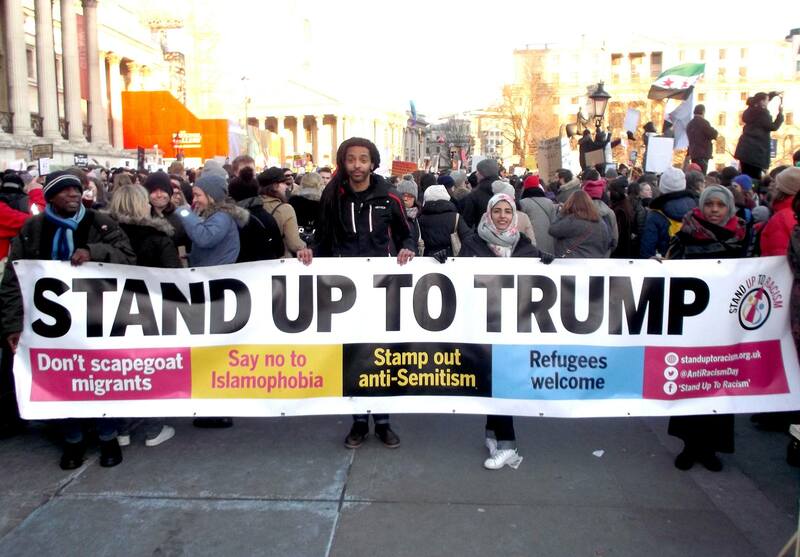 The warmongering racist sexist bigot US President Donald Trump is set to come to the UK on 12-14 July 2018 – we need to organise to give him the welcome he deserves! TRUMP TEACH–IN: WHAT MAKES DONALD SO DANGEROUS? Thursday 5 July 7pm Leeds University Business School – Maurice Keyworth Lecture Theatre G.02. Organised by Leeds Stand Up to Trump and Leeds University UCU with speakers inc. Prof Richard Seaford (British Committee for the Universities of Palestine) on Trump and Palestine, Kathy Saemian (Iranian activist) on Trump’s war plans for Iran, Prof Gary Dymski (Leeds) on ‘The Contradictions of Trumpean Economics’ and Sam Kirk (Leeds Stand Up to Racism) on Trump’s racism and the growing threat of the international far-right and Dr Diane Nelson (Leeds) on Trump and the environmental crisis.